Here in Phuket we are in the midst of an incredible retreat by luminary meditation teacher, scholar, Tibetan translator Alan Wallace. He graciously offers his teachings for free, so if you’d like to join us via podcast, go here and subscribe. In March of this year, I went to Sarnath, India, where Shakyamuni Buddha gave teachings for the very first time. While I was there I had the incredible good fortune to have a private meeting with His Holiness the 17th Karmapa. My meeting was limited to 3 minutes, so I had time for one question and one photo. In answer to my question, he essentially reminded me that the best way to use this precious human birth is to practice taming the mind through meditation, and to use that training to develop compassion for all sentient beings. 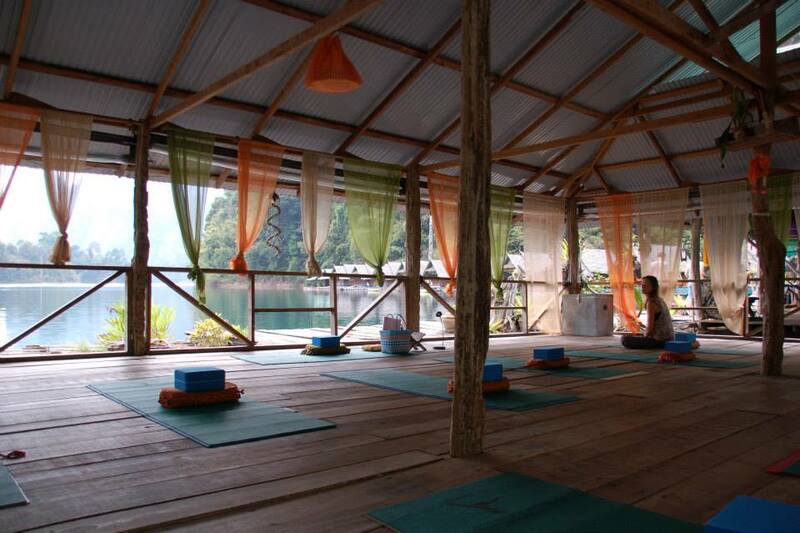 I’m just back from leading a 2 week retreat at Jungle yoga in Khao Sok National Forest, Southern Thailand. It is my new favorite retreat center in Thailand! All of the buildings, including the yoga shala, are on floating rafts on the Ratchaprabha Dam. The retreat season is from November to April, with various teachers coming in from all over the world to share a wide array of offerings. Gorgeous scenery surrounds a man-made reservoir that is home to an incredible variety of nearly extinct wildlife. Every morning we woke up to the sound of gibbons and hornbills. It is one of the most peaceful environments I know. I will definitely return here to host another retreat. Click here and leave your email address to stay updated on when that will happen. Practice or learn yoga and meditation while visiting sacred sites throughought the Kathmandu Valley with masters of yoga and meditation. Join us for a magical 10 days of practice and pilgrimage through the Kathmandu Valley. We will visit sacred Buddhist sites throughout the Kathmandu Valley and practice daily yoga asana, meditation and teachings from Tibetan Buddhist masters. This is an incredible and rare opportunity to study both yoga and Buddhist philosophy and go deeply into both practices with teacher experienced in both traditions while immersed in the culture that spawned the Buddha. Click here for more information and a detailed itinerary. Send me a message if you are interested to learn more about this amazing retreat. There are very few spaces available. This is an incredible opportunity to experience the sacred sites of this mysterious land with experienced guides. If you have ever wanted to visit Nepal but didn’t know how or where to start, this is your chance! Don’t miss this unique opportunity! Write to me if you have questions. If ever you need a reminder on why to practice Dharma, Pema’s message of love is the only reminder you need. Enjoy. Giving Our Best: A Retreat with Pema Chödrön on Practicing the Way of the Bodhisattva – Trailer from Shambhala Publications on Vimeo.